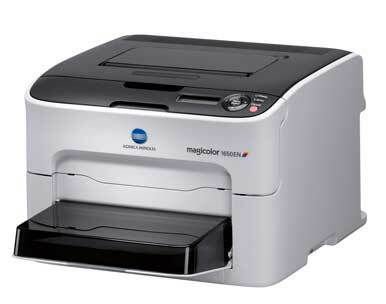 The Konica Minolta magicolor 1650EN is an inexpensive color laser printer that produces beautiful black text and vibrant color images, and offers reasonably priced (albeit low-capacity) ink cartridge replacements. One of the first network color laser printers to break the $400 mark, this is an affordable home-office printer. With its compact, opaque plastic design, the 1650EN is one of the smallest color lasers we’ve reviewed. It’s also comparatively lighter than other leading color laser printers, but at 33 pounds it’s by no means portable. On the surface, the 1650EN has economics on its side. It has the lowest price of any color laser printer we’ve encountered; as of press time, it bests its lowest priced competitors, the HP CP2025DN ( ) and Lexmark C544DN ( ), by about $150. And with that you get standard features such as USB 2.0, 10/100 Ethernet, and PostScript 3 emulation. It costs only $399 to replace the Konica 1650EN’s toner cartridges (more than the price of the printer itself), while the cartridges for its closest competition, the HP CP2025DN, costs at least $486. But lower prices can be misleading. The purchase prices of the 1650EN’s black and color cartridges seem reasonable, because of their low capacities the printer carries a higher price per page than its competition. The black ink cartridge, for example, costs a mere $72, but it prints only 2,500 pages—less than half of competing printers’ ink cartridge page yields. The $109 price tag for each cyan, magenta, and yellow toner cartridge is also comparatively cheap, but the 2,500-page count puts the price per page on the higher side—north of 15 cents per page. This means that the 1650EN is actually more expensive than its competitors to use if you have high-capacity printing needs. The Oki Data C6150dn ( ), for example, has a higher initial price tag, but it costs only 10.5 cents to print a color page. Print yields are analogous to paper capacity with the 1650EN. The 200-page paper tray is on the small side and its inability to perform duplexing as a standard feature makes the 1650EN a poor fit for businesses with high-capacity printing requirements. You can purchase a hardware add-on for $139 to give the 1650EN duplexing abilities, but users who need it will likely also need a higher-capacity printer. Unfortunately, the 1650EN is exceptionally slow. The 1650EN finished our 10-page Word test 32 percent more slowly than the Oki Data C6150dn, our current top product in this category. For offices with heavy black text printing requirements, printing 10 pages in 52 seconds is painfully slow. A single page took 26 seconds to print, which is more than twice as slow as the Oki Data C6150dn. Color printing for the 1650EN was equally sluggish. While the top laser printers on the market took 30 to 60 seconds to print our 22MB Photoshop image, the 1650EN took a nonchalant 3 minutes and 50 seconds to print this same picture. The 1650EN finished the 4-page PDF test in 2 minutes and 30 seconds—a full two minutes behind the Oki C6150dn. Despite its slothful speed, the printer does turn out high-quality documents. In our jury tests, the black text was judged to be of Superior quality, while our Photoshop image quality and Fine Lines and Gradients tests earned Very Good scores from our judges - though only after running an, as yet unreleased, firmware update we received from the company that fixed an error where certain graphic elements failed to print. Konica Minolta representatives say that the firmware update is undergoing final testing and will be available from their support Web site soon. In the meantime, owners of the 1650EN calling Konica Minolta's tech support with this issue will be offered the pre-release update. The compact Konica Minolta magicolor 1650EN can be ideal for low-capacity printing in a home or small business setting. Though replacing the consumables is cheap, you’ll do it often and will have to absorb a higher price per page. Businesses with high-capacity printing needs should be wary of this product, but home users who may never burn through thousands of pages may find the 1650EN more appealing. In a home setting, the 1650EN’s comparatively slow printing speeds will be outweighed by the printer’s strong color and black text printing quality. The market has been slow to produce a color laser printer economical enough for a home setting, and the 1650EN may just satisfy that niche.